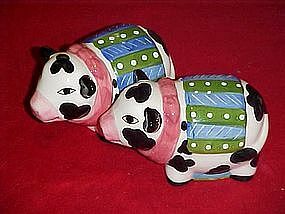 These cute holstein ocws wear a colorful blanket and scarf. 2 and three holes to distinguish salt from pepper. Made by CIC. Plastic stoppers. Made of hand painted glazed ceramic. Measures 2 1/2" tall and is 4" long. Perfect condition.